REDDING, Calif. – While most college graduates spend the summer relaxing or vacationing with friends and family, Simpson University graduate Caleb Sanders found himself preparing to donate one of his kidneys to his older brother. On June 8, the 22-year-old history major underwent surgery to remove one of his kidneys at Stanford University Medical Center. 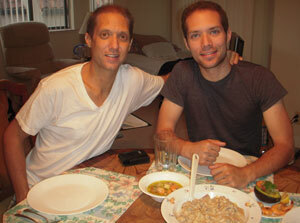 His 35-year-old brother, Adam, had been living on dialysis without kidneys for nearly one year. At the age of 18, Adam was diagnosed with a liver disease (primary sclerosing cholangitis, or PSC) which led to a liver transplant at the age of 21. A series of other health complications soon followed. He had surgery after his appendix ruptured; he experienced liver rejection and a recurring bout of PSC; and through two separate surgeries, doctors removed both of his kidneys after finding several cancerous tumors. Until he received Caleb's kidney, he needed dialysis eight hours a day, three days a week. Caleb said he knew the possibility of being a donor match for his brother was likely, and it would be an easy decision to make. "My brother is my role model," he said. "To see him go through everything he has, it was a no-brainer that I would give him a kidney." 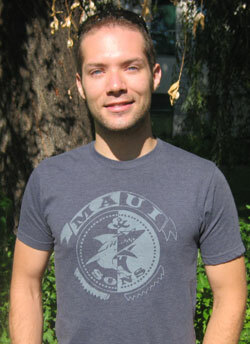 Adam worked full time as a San Benito County juvenile probation officer for 10 years. Between medical procedures, he traveled to Mexico on missions trips. For over eight years he has volunteered for a non-profit organization that advocates for indigenous workers from Oaxaca, Mexico. "He has such a heart for people," said Caleb. "He's done more in 10 years than most have done in a lifetime. Over the years he's helped the people of Oaxaca create a community garden, and he continued to work over 60-hour work weeks in the midst of his health complications." In 2010, when the Sanders family first learned that Adam would need a kidney, family members -- including parents Ross and Donna, and Luke, the middle brother -- were checked to see if they were a match. "We all agreed that Ross would be the best choice," said Donna. "So when we received news that his case would not suffice, it was very hard for Ross to feel like he was so close, yet so far in sparing Caleb this cost." Over the next several months, Caleb would balance his studies at Simpson with frequent trips to Stanford to receive further testing to make sure that he was a suitable match. Doctors told him they rarely choose kidney donors under the age of 30, but because he was in good health they would consider moving forward. "I remember being in the library at Simpson when I got the call," said Caleb. "The nurse told me that because of our genetic makeup, there wouldn't be anyone who would be a better fit for Adam. I was his perfect match, and finding a perfect match is rare, even in families." On April 30, as he earned his bachelor's degree at Simpson's spring commencement, he had other things on his mind. "It all seemed very surreal," he said. "I was a dedicated student and graduated with honors, but I couldn't help but think, 'this is just a degree.' It put things into perspective for me." Knowing that an employer wouldn't be likely to hire someone who was preparing for surgery and would need several weeks to recover, Caleb stayed in Simpson housing and waited to hear from the doctors. In the meantime, Adam continued to help others despite dialysis treatments and frequent health complications. It wasn't until the day before surgery that the family was notified that Caleb had been approved for the procedure. Caleb and his parents drove to Stanford the evening of June 7 to meet Adam at the hospital. "It was a quiet ride," said Caleb. "All you have are thoughts running through your mind. Knowing that I was doing it for my brother helped my resolve. It was a quiet calm." At 7 a.m. the next day, Ross and Donna's oldest and youngest sons began a 10-hour surgery with the hope that Adam would accept Caleb's kidney with no complications. "It was very sobering knowing the risks of surgery and that our youngest son was sacrificing so much," said Donna. "During the 10 hours of surgery we were amazingly at peace. Friends and family were with us the entire time. There were so many people praying for us we truly could feel their effect." After the surgeries, doctors told the Sanders family that Caleb's kidney began working immediately for Adam. Adam said within two hours after surgery he felt better than he had in years. "It's like going from darkness to light," Adam said. "To be so ill and then feel this surge of life go through you -- the change is so drastic." Doctors advised Adam to live within one hour of the hospital for six weeks, and Caleb stayed in patient housing for nearly two weeks after the procedure. "As cliché as it sounds, Caleb gave me the gift of life," said Adam. "It's a harder procedure for the donor, but he still chose to go through the pain for me when there was no guarantee that my health would be good." Throughout the process, Caleb said neither Adam nor his parents pressured him into being a donor. "My brother left it entirely up to me," Caleb said. "There was no pressure." Caleb has a few restrictions to his health and diet after donating a kidney. He needs to avoid alcohol and soda and limit foods high in protein and sodium. He also needs to limit any heavy lifting or strenuous activity for a temporary period of time. While he continues to recover, Caleb hopes to find an office or retail job. He plans to take one year off before enrolling in graduate school. "My family has experienced a lot of injuries and health issues, and like any other family, we've struggled," said Caleb. "But we have always trusted in God to carry us through. My testimony is not what God has done for me but how my family has stayed together and strong through trusting in Him."